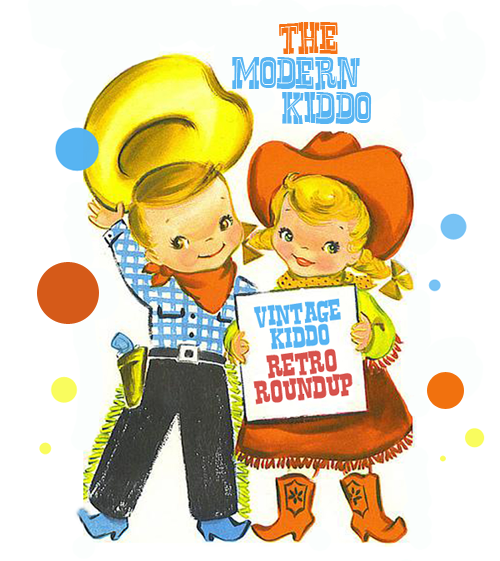 Your weekly dose of vintage goodness! Wow! What a weekend! The Peach turned three this weekend and we threw her a dandy of a party! Expect to hear all about it and all the crafty craziness that happened around it. But even with all of the birthday bonanzas happening, I still of course found some awesome vintage goodies to share with you, friends! Sublime. Simply sublime. What an amazing little swimsuit… From Etsy seller, Bond Place Vintage. Peter the rabbit hopped over to this sweet blue and white vintage sweater. From Etsy seller, Star Friends on Earth. I love the idea of this Colorform Barbie paper doll! Perfect for little hands that can’t deal with the little tabs on normal paper dolls! Well done! From Etsy seller, Traveling Mercies. Oh my word–Lishyloo–where did you find this amazing poncho with the U.S. of Yay colors of red white and blue on daisies? Who doesn’t love a little ruffle? And these sweet ruffles matched with this happy yellow and pink printed dress. Sigh. So happy just looking at it. From Etsy seller, Crooked Tree Vintage. I love boys in plaid pants. And I would certainly love any boy in these sweet plaid pants.Wouldn’t you? From Etsy seller, Odelette. I love these vintage racing jackets and this one is in perfect condition. Just like the ones the boys wore in West Side Story. From Etsy seller, Stop the Clock Vintage. Oh, if I got my hot little hands on this lot of sweet vintage Archie comic books, you wouldn’t see me for a week. My favorite Archie comics were the ones From Etsy seller, Little Red Polka Dots! Wow! I’d like these snappy shoes in my size, please! And never been worn to boot. SWEET! From Etsy seller, From Eve with Love. Check out this flower power mini dress. Perfect sunny–just like your little girlie! From Etsy seller, Sweet Shop Vintage. My doctor as a kid had one of these beauts–a sweet Vintage Price airport. Awww yeah! From Etsy seller, Oopsee Daisies. How funny – My mother-in-law kept my husband Fisher Price Airport…. (among other vintage things she kept that are not in always good conditions…) so now my sons are playing with it big time when we’re visiting! Melanie–my mom kept my castle and the Peach played with it the entire time we were at my parents’ place over Christmas. Such fun! I love that your boys are enjoying their Dad’s toys! I got the pants! Thank you! Aww yeah! Sweet! So glad to hear it, lady! amazing finds! thanks for sharing! i want those shoes!! Tiffanie! I’ll try to do that next week! Thanks for the inspiration! Happy birthday to your Peach! Thank you for featuring my dress today! I love and adore that poncho! Such cute finds this week! I had those same Barbie Colorforms. I totally forgot about them until I read this post! !